POSTS Titan Pull Up Bar Review – Should This Be Your Next Purchase? Doing pull ups may seem like the preserve of bodybuilders and posers. But the fact is everyone should be doing them. I’ve been using one for several months and am impressed as well as amazed by the results. I would highly recommend that every home be equipped with a Titan pull up bar. The pull up bar will work your back muscles, your abs, your biceps; in fact it will work every muscle in your body. It will also build muscle faster as you are working against the force of gravity. The best exercises include the Flex Hang – where you hold your chin over the bar for at least a second. The negative pull up is simply lowering yourself down from a head over bar position. The point is to do it slowly. Control builds strengths which prepares you for the classic pull up. You can also try the dead hang. This is the starting point for anyone unable to complete a pull up. All you have to do is grasp the bar and hang; it will build strength and allow you to get a feel for the bar. It is worth being ware that the bar is 53 inches wide, has a bracket depth of 32 inches and height of 31 inches. The Titan pull up bar weighs 35 pounds and must be mounted securely to prevent accidents occurring when in use. 5 stars from Wal-Mart customers. 5 stars from EBay users. 4 stars from Target customers. This is a wall mounted pull up bar. You can only use it if it’s attached securely to your wall. This allows you to set the right height for your needs when you install it. You can also adjust the width of the bar for installation. This will allow you to secure it to your wall studs; whether they are 16 inches, 32 inches or even 52 inches! It is designed to be fastened to either your wall studs or directly into a concrete or brick wall. Once secured it won’t fall off easily! The titan pull up bar can actually be mounted both horizontally and vertically. This may seem like a strange feature but there are a whole range of exercises that can be performed when the bar is horizontal. These will increase your strength and flexibility as they challenge your body into new positions. The horizontal pull up refers to the position your body is in; as you can imagine this is not a position for beginners. You’ll need a great deal of core strength to hold your body steady as you lift your head over the bar. Horizontal pull ups will really build your core strength. The fact that mist pull up bars do not offer this option highlights how good the Titan pull up bar is. The last thing you want when doing a pull up is for the bar to come crashing down on you. There are already hundreds of videos showing this happening to others. But the Titan is not a door mounted system. It is securely anchored and designed to handle 500 pounds. That should be enough for anyone to hang from without causing it to break. Part of the secret of its strength is because it has the triangular supports. The high weight capacity is not just because this pull up bar is attached to your wall. The Titan is made from steel making it very durable and stable. You won’t need to focus on how the bar feels or whether it is about to fall down. You can put all your energy into getting the pull up right. You may think that it is a disadvantage to have to install your Titan pull up bar onto your wall. But, even doorway pull up bars need some installation. In fact, the Titan is very easy to install. You just need to pick your desired height and decide if the wall is dry lined or brick. Brick can be drilled into. Raw plugs can then be added and the pull up bar screwed into place. If your wall is dry lined then you’ll need to find the studs before you can screw the pull up bar into place. Once you’ve set the height and found the studs you can screw the 31 inch high brackets into position. Titan has a lot of confidence in its pull up bar. This is evident by the comprehensive warranty which is supplied with it. You’ll be given the standard 1 year against defects in materials or workmanship. But, even after that time Titan will still repair, replace parts or even exchange the item if it appears to have failed but only been subject to normal wear and tear. It might not be a lifetime warranty but it is a fairly comprehensive one and should give you some peace of mind when you read the Titan pull up bar review and decide to purchase the bar. The problem with workout equipment at home is that it becomes expensive to purchase all the different items you may need. 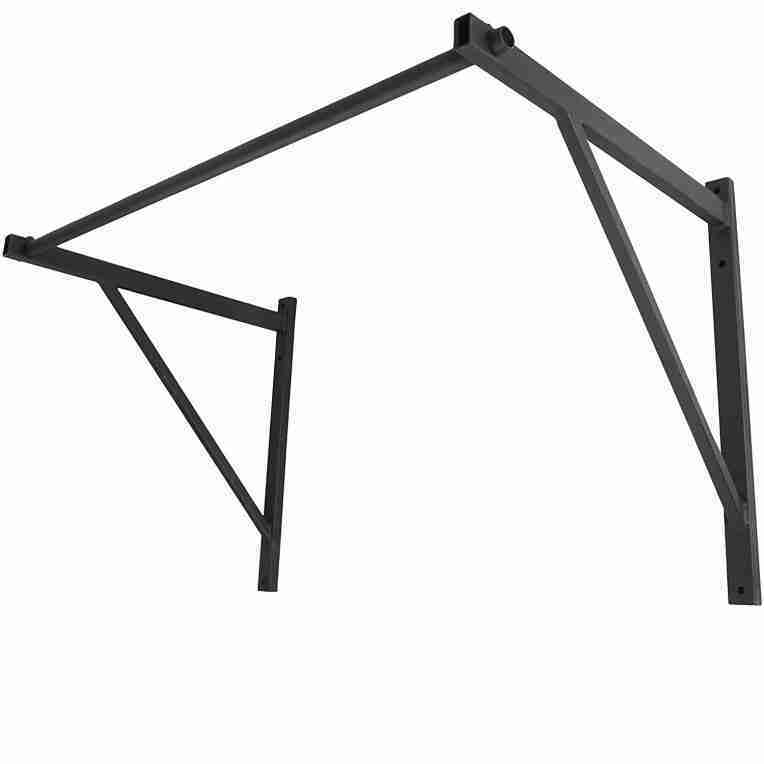 Pull up bars can vary greatly in price with some costing over $100 or even $150. The Titan, despite its strength and solid build can be purchased for less than $100. You’ll struggle to beat this price when looking for a pull up bar which is strong and effective. This makes it affordable and desirable. In fact, considering the amount of muscles it can work out you should consider this as your first and most important item for your home gym. It is worth noting that the Titan protrudes 32 inches from the wall and the bar is 53 inches wide. Securing it to the wall ensures it cannot be easily pulled down or break while exercising. However, this also means that the Titan pull up bar is very visible. Unless you have it in your own home gym it is going to be difficult to make it feel like part of the natural décor of your home. This could be an issue; especially if you are used to sharing your home. It is not something that you want to take off and put on the wall at regular intervals. One complaint that seems to be common amongst users is the lack of padding on the bar. This can make it very difficult to maintain your grip for the duration of your workout. Some users have opted for athletic tape to make the bar more comfortable. While this is a good idea it should not be essential when fitting and using a new pull up bar. This is especially an issue as the bar is designed to be mounted for long term use; it is highly likely that you will struggle to maintain your grip when you first start using it. The Titan sits 31 inches away from the wall. You can adjust this by adding wood blocks before you mount it. However, once it is in position it is not possible to adjust the height of the bar. This makes it difficult for you and your partner to use if you are very different heights. A simple adjuster would make the pull up bar mire flexible and infinitely more useful to men and women. It is also worth noting that extra brackets can be purchased separately. These are not included in the original purchase. These would allow you to create a secondary set up at a different level for another person. But, you would need to use the bar from your original purchase. Unfortunately this would discourage using the pull up bar and still not enable you both to work out at the same time. Several users have noted the issues with packaging. Firstly it appears the pull up bar is sent out whole and therefore arrives in a box as big as a refrigerator! This is disconcerting! More importantly there have been a number of users who have commented on how poor the packaging is. The product frequently arrives exposed through the box. This increases the likelihood of it being damaged. A damaged pull up bar is no use; you’ll be waiting longer to get it replaced. There are a great many benefits to fitting a pull up bar in your home. You and most of the rest of your family will want to try it. Thanks to the solid construction, attractive price and the excellent reputation of Titan products this can be considered to be one of the best pull up bars currently available. While it is not easily taken down when not in use; providing it is not in a regular passageway then it can be a valuable and barely noticed addition to your home. I’ve been using mine religiously and strongly recommend you start doing the same.